3155S- CR-125, CRF-150F, CRF-230, CR-250R, CRF-250R, CRF-450. 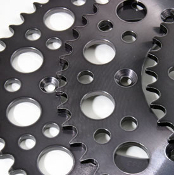 Our Products >> Steel Rear Sprockets, USA >> 3155S- CR-125, CRF-150F, CRF-230, CR-250R, CRF-250R, CRF-450. 3155S- Steel Rear fits, CR-125 1983-2007, CRF-150F 2003-18, CRF-230F/L 2003-19, CR-250R 1984-2007, CRF-250R/X/L 2004-19, XR-250R 1996-2004, XR-400R 1996-2004, CRF-450R/X/L 2002-19, CR-500R 1984-2001, XR-650R 2000-2007. 520 Chain size. Silver Zinc finish.